Staying at Drumnahay Lodge means you will encounter the face of the mountain every day in all its mesmerising shades of mood and glory. It would seem a terrible oversight not to visit the mountain that has deservedly given its name to this Area of Outstanding Natural Beauty. 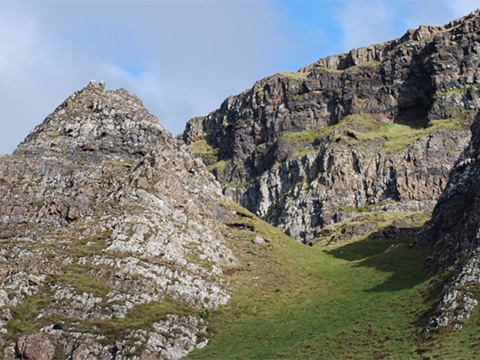 Binevenagh comes from the Irish meaning Foibhne’s Peak. Legend has it that Foibhne was a son of the celtic chief Taircheltar and was killed on the mountain. It is part of a plateau extending for 6 miles, overlooking Bellarena, Benone, Downhill and Castlerock. It marks the western extent of the Antrim plateau formed 60 million years ago from molten lava. At the summit of Binevenagh is Gortmore Viewing Point at 1263 ft. This offers spectacular panoramic views across the peninsula of Magilligan, Lough Foyle, and across to Donegal. The only views comparable to this one are from an aeroplane or glider. On a clear day you will be able to see the islands of Islay and Jura of the west coast of Scotland. You will also be able to pick out Drumnahay Lodge from this amazing vantage point. From Drumnahay, the easiest way is to turn right at the end of the lane. Then about 1 mile along the road turn left into Duncrun road (opposite Bellarena primary school). This will take you towards the mountain on a gentle incline. Continue along for a couple of miles until you see a sharp steep turn-off to the right, signposted Leighery Road. This leads to the Bishops Road. The name refers to the famous Earl Bishop of Downhill Estate, after whom this road was named. |He travelled this road frequently, especially when he was checking for any possible signs of prosperity in the farms/homes of his tenants which invariably resulted in an increase of rent for them. Follow this steep road which will take you up the mountain to join the famous Bishops Road. At the T junction, if you turn left this will take you towards Gortmore Viewing Point and eventually to Downhill. The opposite direction will take you to Limavady. There are picnic tables at the summit, but be prepared for strong gusts of wind. If you wished to stop off on route to see Binevenagh Lake and forest, this is well worth a visit. On your upward journey along Leighery road to join the Bishops road, half way along on the right hand side, you will see signs for the lake. It is possible to go on a walking tour from here to the summit. For more information, check out www.causewaycoastandglens.com/Walking.T267.aspx The Binevenagh walk is Tour 14. 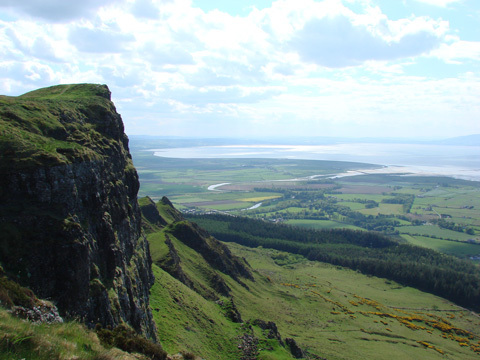 Despite its serene and natural appearance, Binevenagh Lake is actually an artificial lake. Don’t let that put you off. 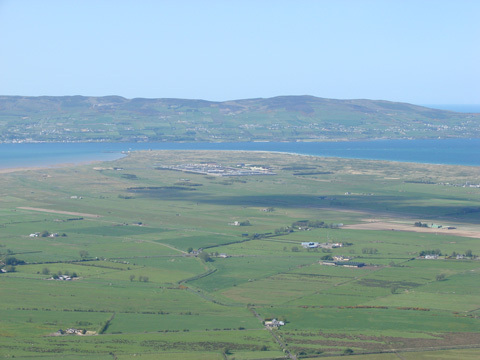 It commands a cliff- top position overlooking Magilligan and Benone and the views are simply stunning. There is a walk around the lake and along the cliff. The cliff walk is dangerous as there is no fence or wall and the path is not laid out. It is a case of following where other footsteps have gone before and staying well back from the edge. Not suitable for dogs or children. 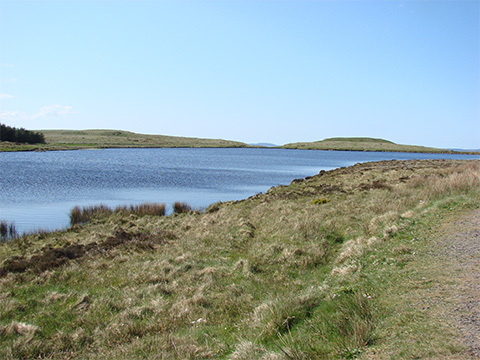 Binevenagh Lake is popular for anglers. Due to the interest shown by tourism, the lake is regularly stocked with up to 2000 rainbow trout. Permits for angling can be obtained from any tackle shop.